After months of deliberation and procrastination, we've finally done it: Traveled by train with our bikes. 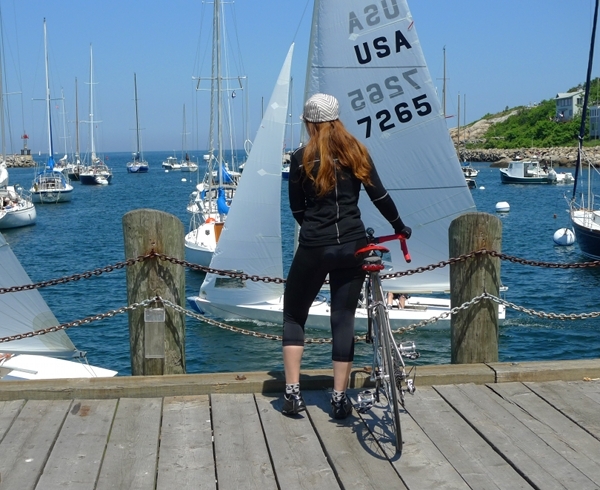 For a while now we have wanted to cycle around Cape Ann, which is a beautiful area about 40 miles North of Boston - accessible by the MBTA Commuter Rail via the Rockport line. A number of people we know have taken this trip with their bikes, so it seemed doable. Also, I was delighted to spot the following notice on the MBTA website: "Commuter Rail re-introduces The Bike Coach on the Rockport line for the summer season." Bike coach! No other information was provided, so I did some research. Turns out they have commuter trains with special cars dedicated entirely to bikes - with bike racks as far as the eye can see, like this. But I could not find any information regarding its schedule, and it seemed that only some weekend trains were Bike Coach trains. A call to the MBTA was fruitless, so we decided to just show up and hope for the best. The commuter train to Cape Ann leaves from North Station, a 3.25 mile bike ride from our house through some of the busiest parts of Boston. I don't like cycling through the city on a roadbike, but on a Saturday morning the traffic wasn't bad. We arrived early, which was good as there was a line at the ticket machines. There were plenty of other people with bicycles. When our train arrived, the conductor came out and announced that all those with bikes must proceed to the first car of the train. Only those with bikes were allowed in that car. Only those without bikes were allowed in the other cars. The segregation gave us hope that this was the fabled Bike Coach, and we happily headed for the front car along with the procession of other cyclists. What happened next was rather stunning. The car we were ushered into had no accommodations for bikes what so ever - just a small corner of space at one end where a couple of handicapped seats had been removed. This was definitely not the Bike Coach. Nonetheless, everybody proceeded to drag their bikes on the train - more and more of them, until not only this corner, but the entire aisle was filled with bikes. When even that space ran out, new passengers began to pile their bikes on top of other bikes. Loud clunking noises filled the train as tubes smashed against derailleurs. Not wanting our bikes damaged in the velo moshpit that ensued, we found a seat near the exit and sort of held our bikes on our laps the entire time. As you might imagine, it was uncomfortable to sit that way for an hour. But the alternative was to accept that a dozen 50lb mountain bikes would be thrown on top of our bicycles - which was not a viable option. So we tried to have a sense of humour about the whole thing and looked forward to reaching our destination while seriously discussing the possibility of Bromptons in the future. But no sooner had we reached Rockport than the train trauma was forgotten, as we were greeted with perfect weather and glorious coastal views. 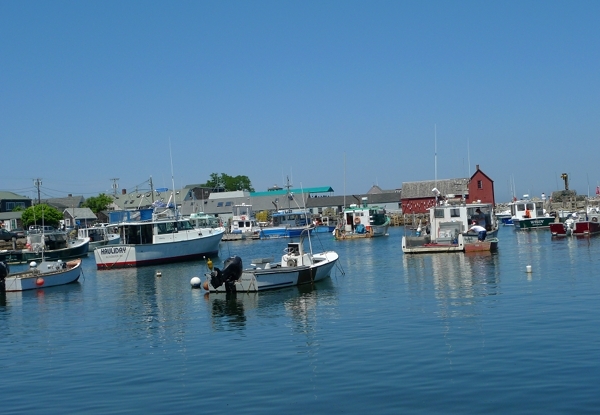 The Cape Ann peninsula consists of Rockport, Annisquam Village and Gloucester - each of them with beautiful scenery. Severed from the mainland by the winding Annisquam River, water views are everywhere. This was our first time in the area and we decided to do an exploratory loop along the coastline instead of a long-distance trip. The Cape Ann loop is about 20 miles, with mild but constant rolling hills, alternating between open water views and tree lined country roads. Especially considering the 4th of July weekend, the area was not crowded. Drivers were courteous everywhere except for the traffic circle in Gloucester, but even that was not too bad. Roads were good on the eastern side of the cape, but terrible on the western side. 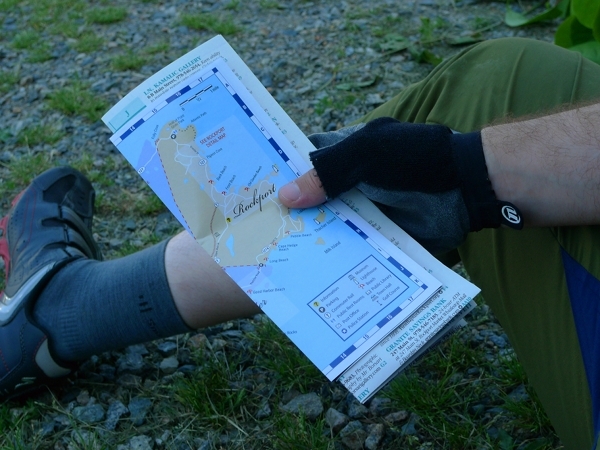 Navigation was intuitive - just follow the coastline! My Rivendell is in the midst of a small (but exciting) make-over, so I took the loaner Seven on this trip. Overall it was pretty good, though a burlier bike might have been a better choice on the pothole-ridden roads. We also ventured off road a bit, which was "interesting" on 23mm racing tires! Cape Ann is even quieter and less commercially developed than we expected, a pleasant surprise. Lots of parks, meadows and nature reserves. Not too many parking lots. And "motel sprawl" is virtually non-existant - at least compared to places like Cape Cod, the NH Seacoast, and much of coastal Maine. 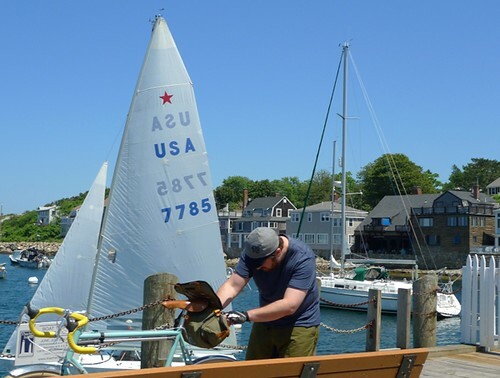 Also, there are apparently sailboat races happening in Rockport - wonderful! All in all, we loved the area and are now considering staying there for longer, instead of venturing further from home on vacation later this summer. 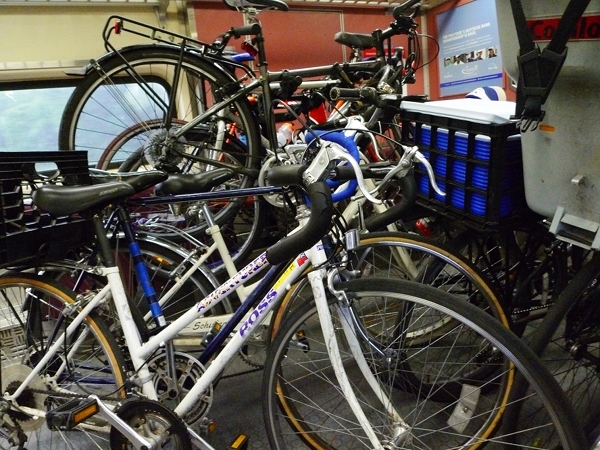 After all - just load up our bikes on the commuter rail, it's so easy! Of course we'd forgotten about our train experience earlier that day. Or at least, we thought, there would surely not be as many bikes on the return trip. Or maybe we would finally get the mythical Bike Coach? Nope, no such luck. On the return trip, passengers were once again segregated into those with bikes and those without, and this time the "bike car" had a car rack attached in the handicapped seating area. 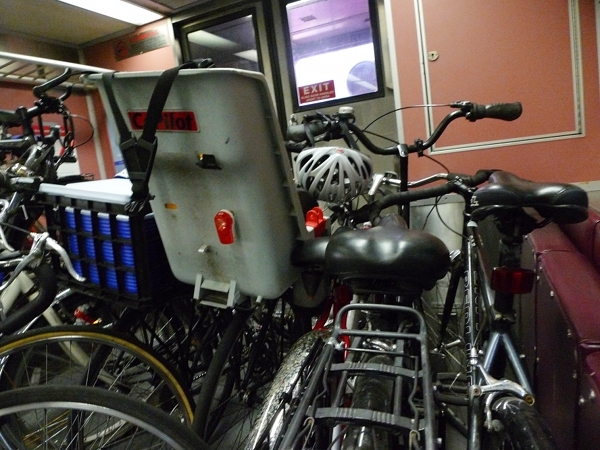 It accommodated 4-5 bikes, tightly squeezed, and was filled as soon as the train began to board. Minutes later, that pathetic little bike rack was surrounded by dozens of other bikes, stacked and thrown against one another haphazardly. Exits were blocked, aisles were blocked - no one seemed to care. When passengers with bikes needed to get on or off, they would simply throw the other bikes out of the way and the whole thing was like one huge pile of scrap metal. So we held our bikes on our laps again - hugging them ever closer to our bodies as other passengers kept trying to pile their bikes on top of ours (yes, even while we were holding our bikes on our laps!). It was a madhouse and probably violated all sorts of safety regulations. The MBTA clearly needs to have these alleged Bike Coach cars run with more frequency and on a predictable schedule. As we now understand it, the schedule is random and there is no way to time your trip to ensure that you will get a Bike Coach. Sounds improbable, but that's how it is! Late in the evening, we rode home from the station along mostly empty city streets, recuperating from the train but also satiated from a day of exploring such a beautiful new place by bicycle. We only cycled 30 miles over all, and the point of the trip was mainly to hang out and get to know the area. Next time we will plan for a longer route. 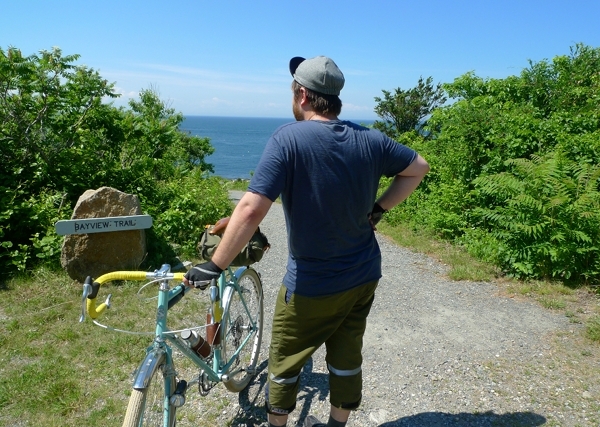 The North Shore is a great starting point for long distance touring: While there is no pleasant bicycle route North out of Boston, from Cape Ann we could just continue to cycle along the coast to Maine. Definitely something to consider, despite the less than ideal commuter rail experience. What is it like to travel on a train with a bike where you live, and do you do it often? Great trip! Here in Seattle the city buses have bike racks on the front, so bicyclists can have them loaded up for a bus ride to any connecting destination. I love Cape Ann- it's so lovely and not as overdeveloped as cape cod. My boss lives in Hamilton and once a year or so he rides into downtown Boston, so it's do-able, but I don't think it's particularly pleasant. Too bad that they don't make more of an effort to advertise when the bike cars run. I take the commuter rail from time to time for work, and I often see bikes in a lot of the cars, just propped in the handicap spots, mostly within eyesight of the owner. I don't often take it at rush hour though, so that might not be permitted at peak times. oh, weird ... I remember taking the commuter rail up three years ago and they totally had racks in the Bike Coach. Maybe it's proven so popular that the number of racks was not sufficient for the number of bikes brought on board so they thought it would be easier to cram more bikes on with taking the racks out? cris - Thanks for the Cambridge to Cape Ann route! The Bike Coach does have racks all along the car, like those in your picture. But not every weekend train is a Bike Coach, and it is impossible to know which one it will be! The train cars we were in were definitely not former Bike Coach cars with the racks removed; they were just normal train cars with normal passenger seats. Bikes were piled along the handicapped/ baby carriage spots where the seats could be folded up, and also in the isles. It definitely did not look like an intentional system, especially since exits were blocked. i've taken the north bound weekend commuter rail to both Cape Ann (Gloucester/Rockport) as well as the Fitchburg lines, and have never had the problems you describe. Perhaps it's because yours was a later train -- our departures are usually very early. Only one time have i ridden the mythical Bike coach, and it was a delightful surprise. i wish it could be every single train, or at least every single weekend train, but until the MBTA gets more money, i doubt it. I do like your idea that they could perhaps at least POST which trains get it. i'd also recommend taking the Fitchburg line which stops in Porter Square. Much easier, and it's beautiful out there! JPTwins - That is good to hear. If it was specific to this weekend, that would be good news, though I heard people say that it's always like this in the summer. And yeah -we did not take the early morning train, so it is possible that the 8am one would have been less crowded. Caltrain is a commuter rail line between San Francisco and San Jose...about 50 or so miles. Each train (*with one exception) has a car with only four seats and the rest is open for bikes. Four bike racks, holding three or four bike on each side means about 32 bikes in racks. There is a tiny single seat overhead section where bicyclist stay in the car, up above, looking at their bikes. It works pretty well. Their website says "Caltrain has the most extensive bicycle access program among passenger railroads in the nation." The subway system "BART," doesn't have any bike cars, bicyclist put them in regular cars, like you did. Except they are not segregated, the are in all the cars so it is spread out to two or three bikes in each car. * Caltrain has some "Baby-Bullets" which only hold eight or ten bikes then sell-out and bicyclist have to wait for the next train. Chris - What happens if there are more bikes than spots? Are passengers allowed to pile their bikes on top of others? Los Angeles Metro allows bikes on the rail lines, and those extend to Union Station, where you can catch Amtrak, and all the way to Long Beach. The Metro recently lifted their "folders only during rush" rule, so bikes are on the train all the time. They do not segregate, so cyclist look for open spots among all the cars and distribute. Usually we hang in the covered opening between cars where there are no seats. And I've never seen the 'bike pile' solution. Cyclists usually stay with their bikes. On a visit to Portland, OR last year, their metro trains actually have places to hang bikes right near the entrance. It makes for a very efficient ingress and egress from the train for cyclist and non-cyclists alike as it keeps the bikes out of the aisles. Here in Louisville, Ky. we have a struggling bus system and no other transit options. Fortunately, I choose to live close to the central business district in a very fine older neighborhood. 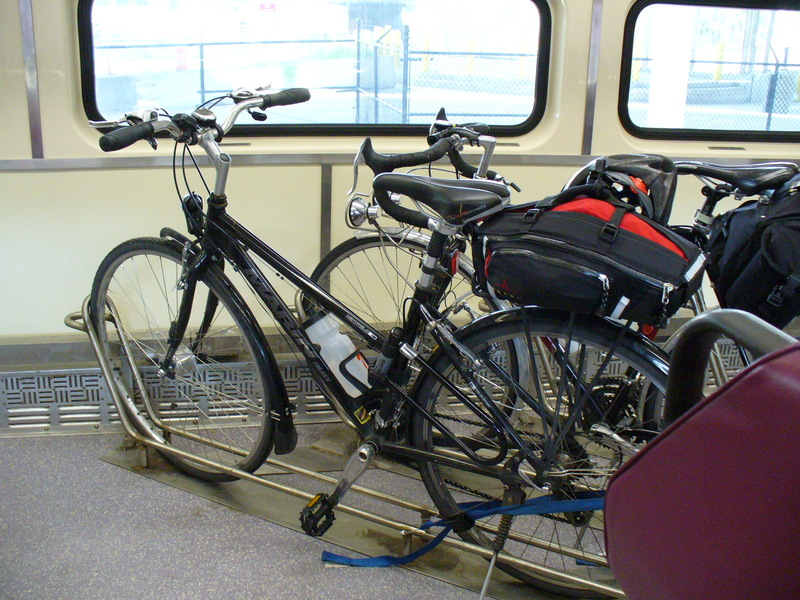 All Transit Authority of River City (TARC) coaches are equipped with two-position bike racks on the front. When the bus schedule cooperates, I can load my bike on the bus to avoid unpleasant weather, for example. Sadly, Amtrak doesn't serve Louisville. If you want to take a train to Chicago, Minneapois, D.C., or wherever, the nearest station is Cincinnati, 130 miles away. To attend the week-long National Bike Summit in March, I rode my Surly Long Haul Trucker to Cincy, all day Saturday in a pouring rain, removed pedals and handlebar, and boxed the bike after midnight for a 4:30 a.m departure. The schedule is limited to two days a week and takes 14.5 hours. At Union Station in D.C., I unpacked and reassembeled the bike. The D.C. Metro limits bikes to certain off-peak hours. Elevators and escalators are challenging. We've been talking about Bromptons on and off for the past 2 years. The basic bike is, I think reasonably priced given its quality and reputation. But the problem is that we'd want it with dynamo lighting, lots of gears, the works - and the overall cost would be prohibitive, especially for 2 bikes! Adding those options to less expensive folders would be similarly prohibitive though; dynamo lighting in particular. 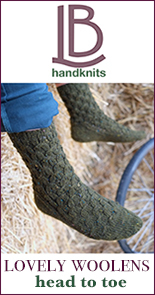 But that Montague Paratrooper looks interesting! "On the train home, I used my iPhone to order a Brompton"
They should film an advert based on your story. Paying you handsomely for the rights to it, of course! I travel by train with bike several times a year, but a folder is the only thing practical if special coach arrangements aren't available. I'm really happy with the Dahon expresso even though I am philosophically allergic to aluminum frames. The Shimano dynamo lighting system on the Brompton only adds $115 to the cost - I was really kind of surprised by how inexpensive it was. I have a Brompton and a Bike Friday, and I would recommend them both without reservation. But unless you plan on riding them all the time (as I do; they are my only bikes), they do get pretty expensive. By far the cheapest way to get a Brompton is to buy used in the UK - there are sometimes astonishingly good deals. Other than the whole bike in your lap thing, looks like a great day out! Here's the bike coach you missed! Since going car-free I've been using NJ Transit for part of my commute on some days. The deal here is that you can't take a bike on a train headed East during morning rush hour, or headed West during evening rush hour (ie towards or away from NYC, which is OK because that's the opposite of my usual commute). You also can't take a bike on the train on holidays or the day before holidays, which got me yelled at on Friday because apparently it was the "day before" July 4. There is space at the end of each car in the handicapped seating, where the seats can be folded up to bungee a bike to the wall, on bike per a side. If the spaces are full, or there are handicapped or elderly using the seats you have to wait for the next train (which, once you get this far away from the city is either "in two hours" or "tomorrow"). All in all, I'd rate the train/bike experience in my neck of the woods as "better than nothing", and since my current barely-employed status sometimes requires me to juggle multiple part-time jobs in a single day, it can save me a bit of hassle on the occasions when I can fit my schedule to the train's. I've considered a Montague as a possiblity when I have more regular employment. Bromptons, Bike Fridays aren't especially clydesdale-friendly (not to mention costing several month's income for even their most basic offerings), so they'd be a poor solution for Yours Truly, but I have a friend who is a folding bike afficianado who uses his Bike Friday Tikit for train commuting. Sometimes it is nice to be in an area like DFW where few ride bikes. More often than not, I'm the only one with a bike in the whole commuter rail car. I think you're going to cry when you have to give that Seven back. Wow. Sounds like a great trip! (Except for the absence of the Bike Coach.) When my wife and I lived in Somerville (1986-87), we visited Cape Ann from time to time and spent some wonderful days at Wingaersheek Beach. Thanks for the trip down memory lane! 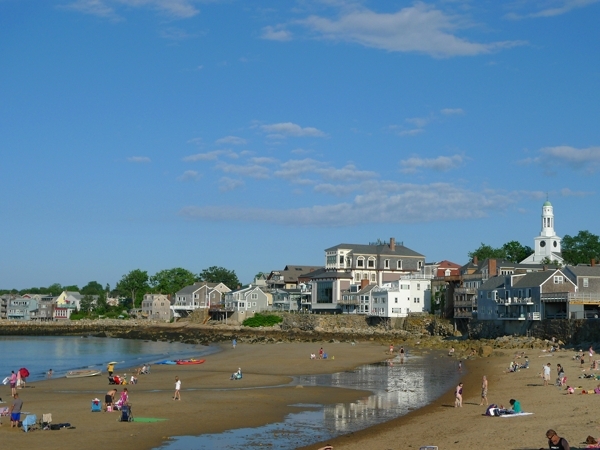 I used to live in Gloucester for 11 years while working in Marblehead. Since regular bikes weren't allowed on the trains during rush hour, I bought a Brompton to use on my commute. Rode to the station, quick fold, train ride to Salem, unfold, ride 5 miles to Marblehead. The Brompton was great for that purpose. However, I don't find it comfortable for much more than 5 miles due to the riding position. Of course I am 6'2" tall. Glad you enjoyed Cape Ann, I made that ride many times while living there. Chris Igleheart also rides to Boston from the North Shore frequently and he has a good route you might want to ask him about. I would have also taken the Seven. Velouria- Gladly! Hope you watched the second part as well! Definitely the good ol' days... at least in regard to bike riding! Bif - Why is that? Being lighter and with a smaller wheelbase, the Seven was easier to take on the train, but the Riv would have been better once actually there. Potholes and off-road on 23mm tires, plus no luggage make the Seven less than ideal for many types of rides. Here in Australia we have bike hooks in every second rail carriage, so that only permits one bike to hang for that carriage. But there is also an area at the end of some of the carriages where you can stand your bike and I have travelled using those areas. There have never been so many bikes on the train that the bikes piled up when I've done this, there has been room for half a dozen bikes and their owners to stand with them. Of course, these trips have been quite short, I would not like to take a long trip having to stand by my bike. In Western Australia I catch 2 trains to work on the suburban line. Bikes (other than folders complying to Transperth dimensions) are banned during the 2 hours peak travel at either end of the day. However, as I work nights this is no problem. I park my bike in the bike spot by the door, if it's crowded (after Aussie Rules matches) I use one of the folding seats and stay with it. There are only ever a few bikes and there is no way Transperth would allow the sort of pile-up you had to avoid (I felt pretty shocked looking at the photo. Surely it presents some sort of safety issue). 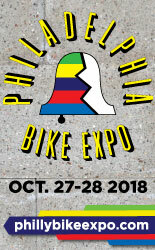 It is free to travel with your bike within the metro area. If I use Transwa to travel to the country, it doesn't matter how many Kms I'm going 100km or 400km the bike ticket is $10 and can be purchased for both train and coach. I always pre-book these as there are theoretically limited spots, although I have never seen anyone's bike refused. On the coach it is safely stored with the luggage, upright in the hold with no tweaking of pedals or handlebars required. On the Australind (train) it is stored in a little hobby-hole behind the driver's cab and the kind attendants have always been on the station holding my bike at the ready for me as I disembark. I love the combination of trains and bikes. In fact I'd be hard pressed, given WA's sparse population and sprawling distances, to manage car-free without it. Whenever I hear about the difficulties of combining cycles and public transport in other states/countries I suddenly feel ridiculously lucky. Heh. 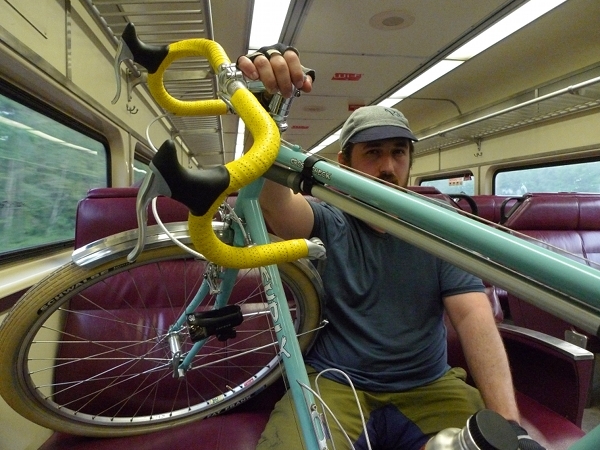 An article about the commuter rail + bike issue is on the NYT green blog today. I put my bike on Metro North from New Haven to New York City a lot. MN will not allow bikes during prime commuting hours, and bikes can be put on any car where the sliding door exit is. One has to watch what happens at each stop, and move the bike if it's in the way. It's fun to ride through Grand Central Station when I get there. MN also makes one buy a bike permit for a few dollars. It's really an insurance release in case your bike gets damaged. The best place for bikes on a MN train is in the bar car, plenty of wide open space with no seating, only upright poles to hold on to. I couldn't imagine a train company allowing bike overcrowding like you experienced. I have a vintage folding Peugeot and my boyfriend has some folding bike with an obscure name (Yeah bike) and we bought both off craigslist, both in pristine condition. My Peugeot had the original Pirelli tires on it. Every weekend we go back and forth between Fort Lauderdale (where he lives) and West Palm Beach (where I live) on the train. We love the fact that South Florida has a commuter train and its called Tri-Rail. It runs from one stop north of West Palm all the way down to the Miami Airport and we've used it to get to the airport too and no need to drive. They say only 2 bikes per "bike space area" but really people pile on like 3-4 bikes at a time. There's rumors going on that when they roll out the new cars, they won't allow full size bikes anymore but that defeats their entire campaign to get people out of their cars. I hope it doesn't come true. My boyfriend will be using the train everyday to commute to school and work when he moves up here in a couple of months. On other news, our stupid governor, Rick Scott, who threw away federal funding for the high speed rail has finally approved the SunRail for the Orlando area. I am glad to see another rail line open in Florida because we badly need it. However he is a hypocrite but I'm glad it got through. I travel frequently by train in neighbouring Switzerland, although rarely with my bike; which I ride, given the choice. However most carriages have a reserved area with hangers and securing straps for up to 10 bikes (the carriages take about 200 passengers). The rule is one bike per person for a charge supplement of 5CHF. However I rarely take a bike because one can hire a pretty good bike (Dutch style, 7speed Nexus, carriers and lights) on arrival, and for a low price (even for no charge at all; in Geneva for example). It is also possible to load bikes into a freight wagon on certain trains and while I have never tried this personally I have had a second-hand bike purchase delivered via freight wagon across Switzerland (Basel to Lausanne) for 19CHF; no damage to the bike at all. So it appears that the Swiss rail system is generally bike friendly, as is Switzerland. Here in the Bay Area we have it pretty nice. As Chris mentioned above Caltrain has lots of space, but is quite popular and the trains are relatively infrequent, so the spaces do fill up sometimes. BART, which runs between San Francisco and the East Bay, doesn't allow bikes during rush hour on trains going through downtown since there's barely space for people. They do provide bike lockers at most stations though. 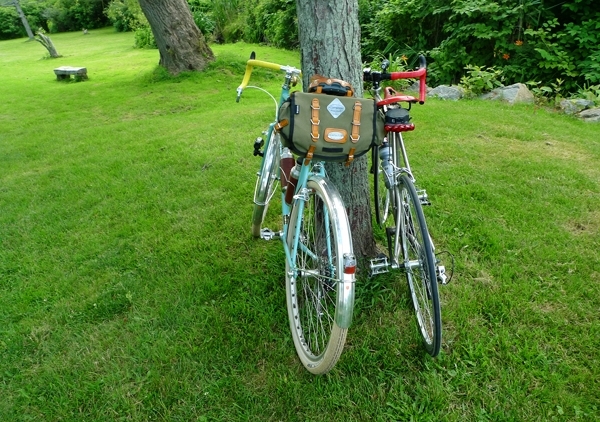 The lack of racks means one has to hold onto their bike during the trip, but at least trips tend to be short. The one nice thing though is the platforms are level with the train floor so one can just roll bikes on. 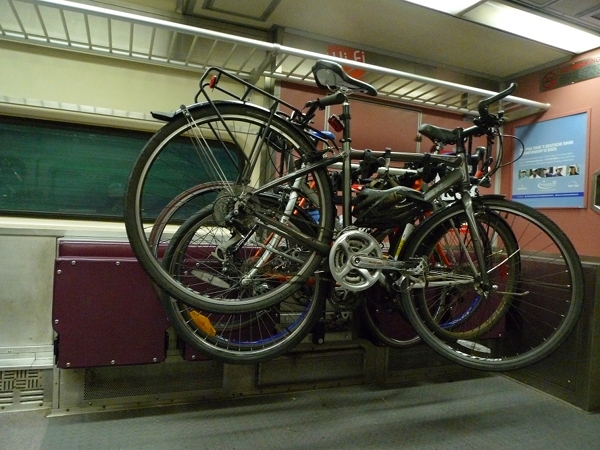 The California Amtrak routes have bike cars with rows of racks on some trains and on others the luggage racks can fold up and turn into bike racks. Having used it before it's quite nice, and there's sometimes a bit of hanging out between all the cyclists. Connecting bus service has racks on the front of the bus or space in the luggage compartments. I can't comment about bringing your bike on the train but I do have a recommendation about riding around Cape Anne. Get off the train a little earlier in Beverly and take Rt. 127 up the coast for a longer scenic ride. 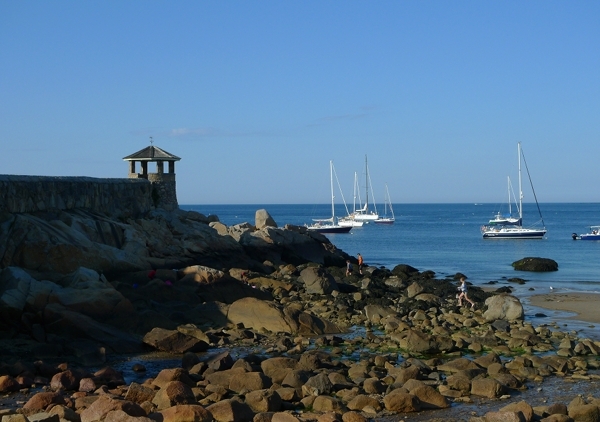 You'll discover some nice little coves as you go through Beverly Farms and Manchester-by-the-sea. It gets a little dicey through parts of Gloucester but then get on 127A and continue on into Rockport. Cape Anne is beautiful, especially this time of year. Just discovered your blog today BTW and am enjoying reading it. 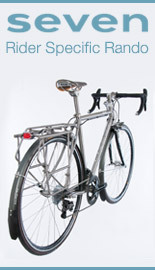 An initiative called Bike Train (http://www.biketrain.ca/) started in the Greater Toronto Area a couple years ago. Both Via Rail (our Amtrak equivalent) and Go Transit (regional commuter trains) have special programs to make it easier to bring bikes on the trains. GO Transit's is a kind of 'Bike Coach' - but with scheduled times! (http://www.gotransit.com/public/en/travelling/seasonal.aspx - go to the Bicycles section). I also bring my bike aboard New Jersey Transit trains -- mostly it has been on the weekends, either to get out of the dense suburbs to go ride in more rual settings, to NYC, or the Jersey shore, but lately I have been using a bike/train/bike combo to get to work every so often. It's always been quite easy -- there are open sections at the ends of each car, as was mentioned earlier, and I have yet to see on board NJT trains even a fraction of the number of bikes in those pictures!! Cape Ann looks beautiful! Too bad about the bike chaos. 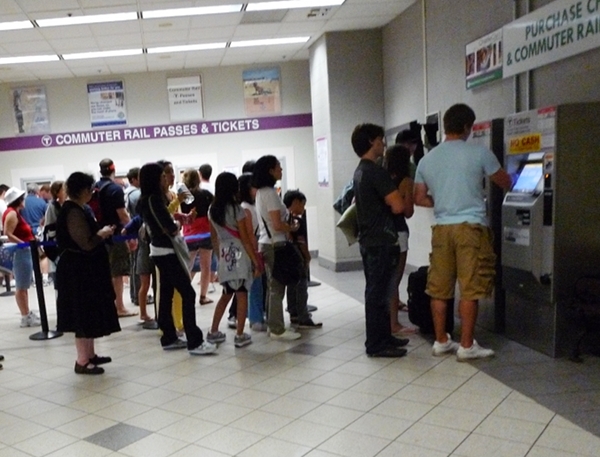 Considering many people have the same idea, the rail line should have a scheduled bike coach. In Greater Vancouver you can take bikes on the skytrain on off hours, but only 1 bike per car or something. All the buses have racks as do the buses where I live which helps if I have taken a bike into the city and cannot bear the thought of biking home from the ferry terminal late at night. I'm not sure what Via rail's cross country policy is, but I don't think it's good. I have heard that the Rocky Mountaineer is much more accommodating. There is a VIA rail line on Vancouver Island which would be fantastic but does not allow bikes! 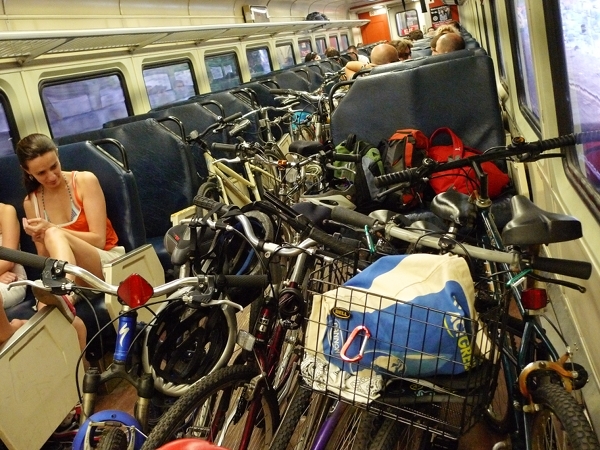 Comparatively Amtrak is supposed to have space for bikes, but no experience with that. I once watched a quaint little film reel about cycling in England in the 1950's. Trains had entire cars just for bikes with hooks from the ceiling. 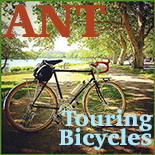 Cyclotouring was very popular with little hotels everywhere in the country side to stop along the way. sigh. I think it is unfortunate to have to get a folding bike when you have wonderful bikes you want to ride somewhere. Folders are definitely useful for commuting, and obviously can be considered 'luggage', but if you have a touring bike and want to do a tour of a Cape or an island etc, seems a shame to have to take a folding bike-unless you already are into folding bikes....they are definitely handy! Here folding bikes are free on all trains (where as a regular bike is 6.80 euros per day). There are special cars for bikes that have seats that fold up and you have to use the seatbelt to hold your bike in place. There have been times that people cram their bikes against mine, but over all everyone's pretty polite about it. No damage so far. This makes me miss New England, but also reminds me how it's not nearly as bike friendly as the West Coast...I've never seen such pileups on the CalTrain system here, but maybe I just don't take it often enough. I guess as francis said it, we have it pretty nice! I take my bike on LA's Metro often, and Gina and I have twice taken our bikes on Amtrak's Coast Starlight--first to San Jose, then all the way to Portland. Amtrak provides oversized bike boxes for that (and numerous other) trains, so all you do is turn the handlebars, remove the pedals if necessary, and roll the bikes in! Worked great. Want to try the Pacific Surfliner (onboard racks, no box required) soon. Oh but haven't you heard? Nobody rides bikes in the USA and there's no public transit ;-) Or so I'm told! Seriously, those place names ring a bell. I must have visited there as a child. I remember it being very beautiful. Anyway, here in Sweden, bikes on trains is a patchwork. Many trains accept bikes but there's always a catch. Either there are limited spaces (like 3 or 4) and no guarantee you'll be let on, or you have to be there 30 minutes in advance, or bikes are prohibited during "rush hour" which amounts to six hours a day, or there's a high charge, or a combination of the above. If I was a more seasoned traveller I might not let this get in the way. But for mere mortals I feel it's worth it to get a folder for the freedom it offers. My Brompton rides fine and it's part of the fun to fold it and take it on trains, busses or inside buildings. A folder makes it easier to explore new places to cycle, and in combination with public transport it can be a fast and efficient way of getting from A to B.
Wow, just noticed this! Thank You soooo much, Anon 4:28!!! Somehow I was not able to find this info, and the MBTA staff I spoke to did not know either. Where I live, (The North of England, UK) Most commuter trains are small, and about forty years old - the bicycle 'facilities' consist of an empty space around 6x2 feet at the end of one carriage out of every train. There is no extra charge, (On 'Northern rail' services at least) but on the busiest trains, bicycles end up in the aisles, and we struggle to get off the train, with our bicycles, at stations. Same situation 'over the pond' then!